Disclaimer: This review was written as part of the Catholic book reviewer program from The Catholic Company. Visit The Catholic Company to find more information on The Pope & The CEO. They are also a great source for a Catechism of the Catholic Church or a Catholic Bible. I’ve studied ethics, and particularly business ethics, both formally and informally. I took courses in undergrad about how best to run a business and then of course in grad school while pursuing an MBA, we had courses, lectures and guest-speakers discuss ethics with us. I’ve read numerous books over the years since that illustrate how best to run a company, a home, a life — what works and what doesn’t. Theoretically, a well-run company or life includes a huge dosage of moral/ethical behavior. But in all this learning, there was always a disconnect between theory and reality … between the spiritual and the secular worlds. 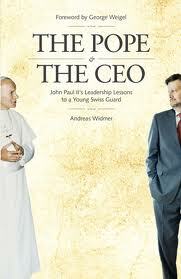 Reading The Pope and the CEO, by former Swiss Army Guard Andreas Widmer, I now have a clearer example of merging my faith with my vocation — whether in the business world, in my home, or in my dealings with anyone and everyone. Widmer, who worked two years in the Vatican in the late 80s, protecting and defending Bl John Paul the Great, uses his own mistakes … his own successes and failures … and links them to what JP2 taught him in those two years. The book is filled with anecdotes about the pontiff, his way of managing himself and others, and all the little things that went together to make JP2 an amazing “executive director” of over a billion of Catholics. Widmer takes these anecdotes and weaves a detailed business/social ethics course from these examples. First, he explains that we each need to truly understand our vocation. As Catholics, we believe our universal vocation, the one that applies to every human, is to “know, love and serve God” by always seeking the good and avoiding the evil. Our individual, primary vocation is either the religious life, the married state, or the single life. This is the call God makes to where we are should be to fully bloom. Our secondary vocation, our plan of action for living, includes our work/profession or involvement in the community, apostolates, or “simply bearing the various crosses and trials that come your way.” We must look at our secondary vocation (whether inside or outside the home) as a way of becoming more: more the person God wants us to be, as giving back to Him a bit of what He gave to us. “Work shapes us, refines us, and pushes us to discover and hone our natural gifts … it’s not something that keeps you from doing what you really love … it’s something that enables you to live more fully the life God intended you to live.” Of course, there will always be conflicts and pulling from one thing to another; but, advises Widmer, if we place our priorities in order (universal to primary to secondary), we should be able to figure out whether it’s better to work late every night or better to stop and attend a child’s play. Once we know where we fit in God’s plan, and have set ourselves on that path, we must turn to prayer. We must know God through prayer, scriptural reading and meditation. Prayer helps us to rediscover the loving face of God. He never abandons his people but guarantees that, notwithstanding trials and suffering, good triumphs in the end. Then we need to know and do what’s right — to treat EVERY situation with the human person’s dignity always to the forefront. When we are business people, we need to worry less about the bottom-line and worry more about our employees, our customers and the public who are impacted by our actions. We need to be person-centered, not utilitarian or self-centered. “That understanding starts with recognizing that all economic activity is undertaken because of human beings… a company exists for two reasons: to satisfy the needs of its customers and to enable its employees and investors to earn a living while using their God-given gifts and talents in service to others … where both the good of the customer and the good of the employees are achieved.” AND, we need to do what’s right even if it’s uncomfortable or unpopular. In the long run, the sacrifice always is covered by the outcome! Widmer’s book is counter-cultural. It recommends that we need to “live as a witness” while living in moderation, never allowing one aspect of our secondary vocation to overshadow another, and with detachment, never allowing our lives to run us. He shows that we need to live with humility and meekness (but NEVER as a “pushover”) in a world that tends to favor the proud and the strong. And throughout his book he points out when he missed this lesson the first time around, but how later he understood what JP2 taught. I highly recommend this book — I’m thinking it should be the text in any business ethics course as well as read by adults to understand what we should do and how we should live. EXCELLENT!